How a 300-million-year-old mystery fossil is reshaping our understanding of what it means to be a vertebrate. Through murky water you spot it – a creature with a cylindrical body, tapering at each end like a football. At one end, a spade-like tail fin fans out as it slowly beats back and forth. At the other end, a thin, kinked snout gives way to a claw gently probing the muddy bottom of the swamp. In the middle of the body, two beady eyes peer out from tips of a long eyebar. Welcome to Illinois, 307 million years ago. Before dinosaurs, flowers, and the supercontinent Pangaea, the expansive tropical swampland including modern Illinois was populated by forms out of science fiction. Yet, even among the likes of towering fern trees, giant dragonflies, crocodile-like salamanders, and eight-foot millipedes, our sea monster was one of the strangest. In fact, Tullimontrum gregarium, nicknamed the Tully monster, was so strange (Figure 1) that scientists have debated about what exactly it was since amateur fossil-hunter Francis Tully first discovered it in the rubble from a coal mine south of Chicago in 1955. But, in a pair of new studies published recently in Nature, research teams led by scientists Victoria McCoy and Thomas Clements believe they have solved the puzzle. Figure 1: An artist’s impression of the Tully monster and some of the fossil evidence showing its unusual features. Where did the Tully monster come from? What is it related to? These sorts of questions are the foundation of paleontology – the scientific study of fossils. Paleontologists seek to use these fossils to understand the history of life on Earth and the origins of modern ecosystems. Despite paleontologists’ best efforts, our knowledge of prehistoric life is woefully incomplete. The several million species alive today are estimated to represent a mere one percent of the lifeforms that have ever existed on Earth. Yet, of the billions of species that might have lived, only a small fraction are preserved in the fossil record. This is because fossils can only exist given the fulfillment of an unlikely series of events. If an organism falls into a body of water and is rapidly buried by mud, it just might be cut off from the oxygen and the microbes that cause it to decay quickly. If enough layers of mud pile up above the organism, their weight can compress the buried sediments into rock. If groundwater can seep through this rock, minerals will replace the hard parts of the organism, and as the rest of body slowly decays, an imprint of the body will be left in the rock. Eventually, nothing of the original organism will be left except an impression of the body, made entirely of rock. The abundance of the word “if” in the last paragraph highlights the serendipitous nature of fossil formation and emphasizes why our records of life are patchy at best. The majority of organisms are lost to us forever. These holes in our knowledge pose a problem: they make it difficult to understand the patterns of evolution that gave rise to these creatures. Life’s evolutionary history not only tells us where these creatures came from, but also reveals to us how modern species came to be, and helps us understand our place among them. The implications are broad. A prime example: evolutionary “baggage” is the reason we have flaws in our body plan, such as the appendix, a now-superfluous organ infamous for needing emergency removal, or our spinal curvature, which leads to lower back pain. To obtain these sorts of insights, however, we need to fill in the holes in our knowledge of life of the past. Tully monster, an anomalous, cryptic fossil, was a question mark on the tree of life. Without knowing the animal’s true relatives, it was unclear if the Tully monster was a mere curiosity, or if it was something more – a key divergence point in the history of evolution. Placing an unknown creature like the Tully monster into the tree of life is a bit like trying to build your family tree without knowing who your relatives are. You may rely on similarities in appearance, such as facial features, for example, if you were trying to pick your dad’s siblings out of a group of prospective relatives. Unfortunately, many people who look very alike are not close relatives, so you might also turn to DNA sequencing, which can reveal how many genes are shared between you and a possible relative. Close relatives share more DNA. The Tully monster highlights many of the difficulties of this grouping process. The confusion rises from its striking combination of features (Figure 1) that have never been found in conjunction elsewhere. Its spade-like tail and cylindrical body shape are reminiscent of an odd group of shell-less snails that swim. On the other hand, Tully monster has bold, serial divisions of the body (Figure 2) that are comparable to the segments of an earthworm or the muscles of a fish. Even so, no vertebrate or worm we know of has eyestalks, and no snail has a claw-like mouth. Could the Tully monster have been one of these three very different animals, or was it something else entirely? Genetic information would help us narrow down the list, but it is impossible to extract DNA from fossils as ancient as Tully monster – only rock is left. Without genetic information to sort out the many confusing and conflicting physical characteristics, scientists were unable to place this cryptic fossil. The trouble was, figuring out what the Tully monster was would require close study of hundreds of fossils, examining traits that were previously unstudied or potentially misinterpreted. Unusually, given the rarity of fossils, Tully monsters were easy to come by – they abound in the Mazon Creek fossil beds south of Chicago, where a prehistoric mudslide buried and preserved an exceptional number of organisms. All that remained was for a gutsy researcher to take on the formidable task of studying all of these fossils. Enter Victoria McCoy, a paleontologist and Tully monster enthusiast since childhood. After studying over 1200 fossils at Chicago’s Field Museum, McCoy and her collaborators were confident: Tully monster was a vertebrate. Several features of the Tully monster fossils led to this conclusion. The most crucial piece was a white line running down the middle of the fossilized impressions of the Tully monster’s body (Figure 2). Although earlier researchers had identified this as a gut tube, this white line contrasted with the gut tubes of other Mazon Creek fossils. In these other fossils, the gut tube preserved as a black line running down one side of the body, near the belly. The color and position of the line in the Tully monster fossils hinted that this feature may not have been a gut tube after all. Among all of the Tully monster fossils, only a precious few were able to shed some light. These fossils had the white line – as well as a black one (Figure 2). This was a lucky find: the white line, then, could not be the gut tube after all. Instead, McCoy and collaborators realized it was a flexible rod called a notochord, which preserves as a white line in other fossils. Notochords are only found in vertebrates. Figure 2: Key pieces of evidence that helped identify the Tully monster as a vertebrate. McCoy et al. showed that Tully monster had both a notochord and gut tube, fish-like myomeres, and a three-lobed brain. Clements et al. showed that, like in a vertebrate’s eye, the retina at the back of the eye had two types of melanosomes. It is currently unclear whether the Tully monster had evolved lenses. Once McCoy and collaborators knew to compare Tully monsters to other early vertebrates, like fishes, its previously confusing features fell into place. Early vertebrates like lampreys, ancient eel-like vertebrates that still survive today, only have notochords and small cartilage lumps called arcualia instead of true bone. Close examination of the Tully monster fossils revealed impressions of arcualia alongside the notochord. Moreover, a comparison of Tully monster to fish indicated that the “worm-like” segments were actually blocks of muscle, separating as they decayed, similar to how layers of muscle flake apart in a cooked fish fillet (Figure 2). In some of the fossils, the researchers could spot impressions of a primitive brain between the eyestalks (Figure 2): a three-lobed structure similar to a vertebrate’s. There were also impressions of pouches on body’s sides where gills were located – again like the lamprey. In fact, a statistical assessment of all these body features revealed that the lamprey is the Tully monster’s closest living relative. At the same time, an independent group of researchers, Thomas Clements and collaborators, reached a similar conclusion. This team used a specialized microscope technique to view fossilized impressions of the cell structure in the Tully monster’s eyes. They discovered that the retinas had layers of two types of light-absorbing structures called melanosomes (tiny pigment deposits that make human eyes brown instead of blue) – spherical and cylindrical (Fig. 2). This layered pattern is another unique characteristic of vertebrates. Although the Tully monster has found its place with its lamprey relatives among the enormous diversity of animals, certain mysteries remain. It is currently unknown how structures like the snout, claw-like mouth, or the eyestalks, came to be. Without genetic information to tell scientists how Tully monsters developed from embryo to adult, these mysteries may never be solved. Yet, our newfound understanding of the Tully monster’s anatomy – unique among vertebrates – is reshaping how we think about characteristics of early vertebrates, the diversity of life long past, and how vertebrates evolved into the familiar forms we see around us today. Kelsey Lucas is a marine biologist and science communicator at Harvard University, who studies the relationship between animal body structures and their functions. Find her on Twitter @kelseynlucas. Clements T, et al. 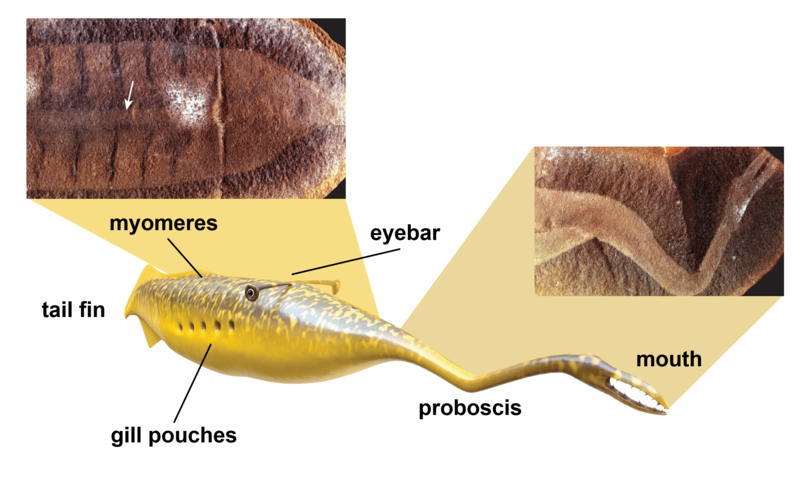 (2016) The eyes of Tullimonstrum reveal a vertebrate affinity. Nature 532, 500-503. Yong E. (2016) Solving the Mystery of the Tully Monster. The Atlantic. The Brain Scoop. (2016) Tully Monster Mystery SOLVED!